https://sep.yimg.com/ay/yhst-33477391359232/yellow-polyp-parazoanthus-species-yellow-colony-polyp-bali-polyps-ballet-dancer-polyps-yellow-encrusting-anemones-9.jpgYellow Polyp - Parazoanthus species - Yellow Colony Polyp - Bali Polyps - Ballet Dancer Polyps - Yellow Encrusting AnemonesEasySemi-aggressiveYesCalcium, Iodine, Strontium, Trace elementsIndo-PacificParazoanthidaeSmall 2" - 3"
Yellow Polyp - Parazoanthus species: Yellow Polyp gives striking variation to the hues of your marine aquarium. A golden yellow color in greenish backdrop looks awesome and therefore, Yellow Polyp is desired by all the aquarium hobbyists across the board. 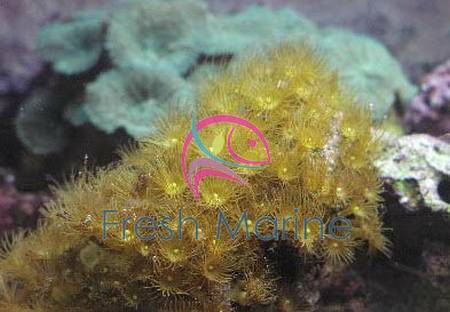 Though all that glitters is not gold but, Yellow Polyp �is� a type of gold as far as the world of marine aquarium is concerned. Other names: Yellow Polyp belongs to the Family Parazoanthidae and Genus Parazoanthus. The scientific name of Yellow Polyp is Parazoanthus species. Yellow Colony Polyp, Ballet Dancer Polyp, Yellow Encrusting Anemone, Bali Polyp and Encrusting Polyp are the other common names of Yellow Polyp. Coral Type: Yellow Polyp is a Hard Coral of Polyp type. Origin or natural range: Yellow Polyp originates in the Indo-Pacific region of a South-East Asian country, Indonesia. Size: Yellow Polyp may be a few inches long. The size of a Yellow Polyp varies, however, being contingent upon the factors such as, the depth of the water level where it is living, its surroundings and the flow of water around the Yellow Polyp. Color: Yellow Polyp occurs in the various shades of gold, yellow, deep yellow, goldenrod, saffron and tan colors. Morphology: Yellow Polyp is very beautiful to look at and grows in colonies. Each polyp has eight tentacles. Its tentacles are colorful and wave with water current. Compatibility: Yellow Polyp is moderately aggressive as compared to the other marine aquarium invertebrates. Breeding: Yellow Polyp breeds easily and speedily in a marine aquarium that meets its environmental needs. The Parazoanthus species reproduces asexually through budding. In budding, Yellow Polyp divides at its base or at its mouth to produce a new Yellow Polyp. Temperature: Yellow Polyp requires a reef tank�s water temperature to be within the range of seventy-two degrees to eighty degrees Fahrenheit. Specific gravity: Yellow Polyp is comfortable in water having the specific gravity of 1.023 to 1.025.
pH: Yellow Polyp needs the pH value of a marine aquarium�s water to be maintained between 8.10 and 8.40. Illumination: Yellow Polyp needs moderate to high lighting in the reef aquarium they inhabit. Water flow in the aquarium: Yellow Polyp requires average to high water current in the marine aquarium they are living in. Marine aquarium habit & habitat: Place Yellow Polyp at the bottom half of your reef tank on a rock in such a way that it gets all its nutrients through water. Keep it away from the other corals as the other corals often sting the polyp tentacles of a Yellow Polyp and the Yellow Polyp also stings the other corals. The sting of Yellow Polyp is not strong and is non-poisonous, however. Feeding & Nutrition: Yellow Polyp is Carnivorous in nature. It, however, feeds mainly through photosynthesis which is performed by a photosynthetic alga, zooxanthellae, living symbiotically within the Parazoanthus species. Yellow Polyp may also filter feed upon acellular marine invertebrates, brine shrimp, marine snow or meaty bits, phytoplankton and zooplankton. Do add Iodine and trace elements to the water of your marine aquarium as dietary supplements to the Yellow Polyp therein. Care: Yellow Polyp is easy to maintain as it is non-poisonous. However, the other corals may sting the tentacles of Yellow Polyp and vice versa and therefore, place Yellow Polyp away from the other corals in your marine aquarium.